There will be reps from the club on hand to chat about the ‘Couch to 50km’, which is a new initiative to get those new to cycling up to a 50km spin over 6 weeks. 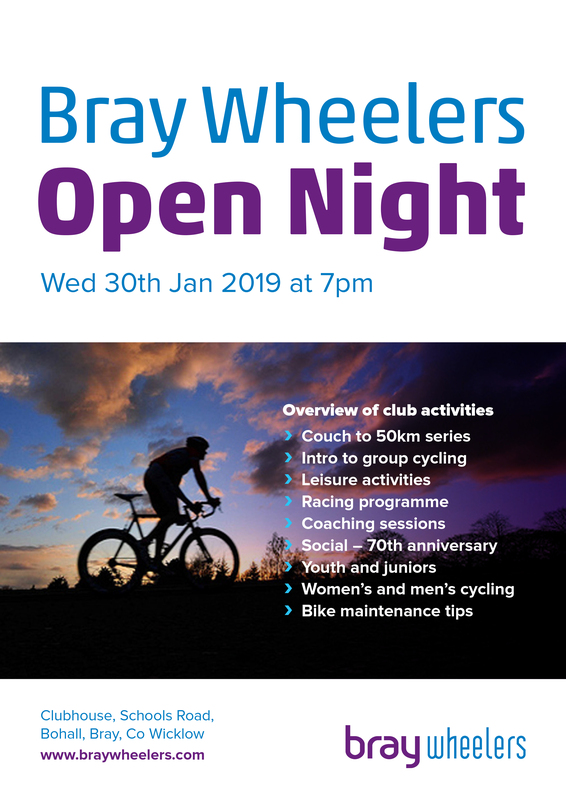 And there is also the 8 week ‘Intro to Group Cycling’ programme, for those who already do some cycling, but wish to experience cycling with a group. Bray Wheelers have a range of Leisure cycling events, from spins every weekend, to randonnees, and the club also caters for those who wish to race, with club and open racing. The club is looking to attract new female and male members, with new events coming for women in particular. And also the club has a varied programme for youth cyclists from 8 years upwards. Hope to see you on the night!